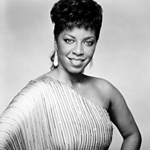 Natalie Cole : Big band vocal charts from Natalie Cole. A selection of Natalie Cole vocal arrangements for solo vocalist with big band. Born in Los Angeles, she was the daughter of Nat King Cole and Maria Hawkins. Her early singing career was very much R&B orientated though, by covering some of her father's songs, she reached a wider audience. She released two albums of jazz standards more than a decade apart that still stand out well today; "Unforgettable ... with love" in 1991 and "Still Unforgettable" in 2008. Many of the tracks were covers of Nat's hits, though she performed them with energy and gusto and put her own stamp on them. She passed away in 2015, having been in poor health for some time. We only have a few charts to offer you at the moment, including "Orange Colored Sky","Avalon" and "This Can't Be Love". We will look to add more of her works in the future.